I’m sure I wasn’t alone feeling a little depressed at the latest regional newspaper sales figures released at the end of last month: double-digit declines for many titles, falls for every single daily and only a handful of weeklies recording plus figures. There was some cheer provided by what looked like good increases in online audiences, although this was tempered by the knowledge that the revenues provided by such efforts are still too minuscule to save jobs. To cheer myself up, I decided to take a good, long look at the UK’s best-performing papers: was there anything they were doing that others should take note of to try to stem a constant decimation of print sales? For the best weekly results it was over to Northern Ireland to the Johnston Press-owned Ballymena Times where circulation rose by an impressive 6.7pc to 3,499. Take a close look at the Times’ latest ABC certificate and you’ll see that there are no smoke and mirrors in these figures: it’s the second consecutive rise and they sell 100pc at the full cover price of £1.10. That’s a hefty price for a paper that had only 48 pages in the Tuesday 21 August edition I got hold of – with a mediocre count of 103 stories on 27 news and features, and another 64 reports on 12 sports pages. So what, if anything, is editor Dessie Blackadder doing differently to create the buzz that’s bringing scores more regular readers in rather than waving them goodbye? The main thing that I spotted was courts – two and half pages packed with a total of 25 stories from Ballymena Magistrates. And these were no simple listings of results picked up from the court office; each report had full detail, context and mitigation where appropriate, suggesting that the Times had invested time and resource sitting on the press bench. As the News of the World used to say, ‘all human life is here’, and on pages four, seven and 13 the Times served up detailed reports on major and minor cases – giving the town’s readers all the neighbourhood gossip they needed. 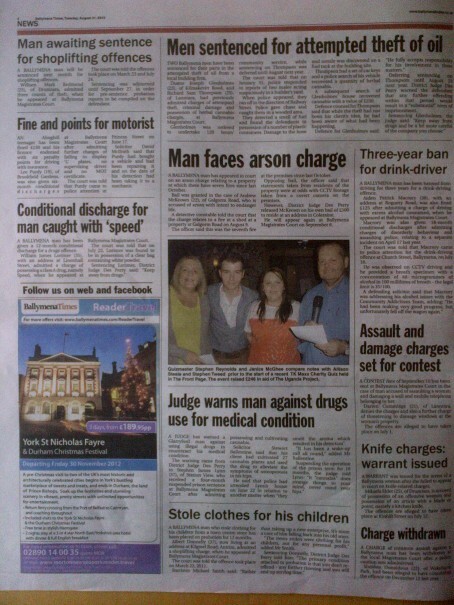 Just feel the human interest in some of these randomly-selected headlines from the 21 August edition: ‘Stole clothes for his children’; ‘Men sentenced for attempted theft of oil’; ‘Driver swerved to avoid dog’; ‘Brain injury contributed to man’s misbehaviour’; ‘Exposure case contested’; and ‘Stole chicken from factory to win a dare’. I’m not suggesting that voluminous courts coverage is the only answer, but it was the content that stood out in that week’s Ballymena Times, which otherwise displayed good enough but unremarkable stories. 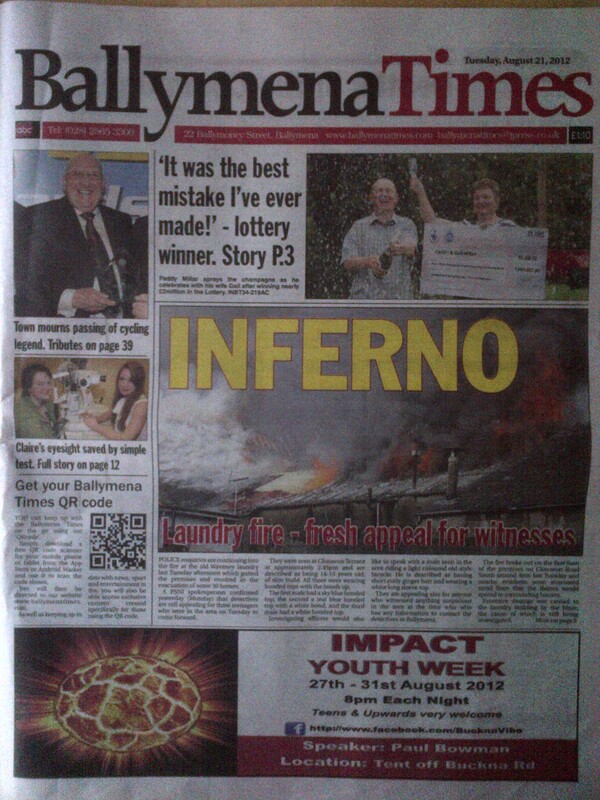 The front page splashed on a dramatic but week-old commercial blaze, and inside stories boosted included a local lottery winner, the death of a cycling legend and a lucky eyesight test. An interesting ‘memories’ spread on pages eight and nine where it appeared readers were encouraged to send in old snaps of team line-ups and events. This resulted in nine black and white pictures with detailed captions under the headline ‘Pictures from the past – they’ve got you all talking’. There seemed to be no limit on the length of page leads; some were ten pars whereas others, like the health news story on page 12, were 40 pars, and the page 39 obituary cross-referenced from page one was 80-plus pars. There were 10 ‘Deaths in the community’ pars on page two, very much in the style of BMDs but definitely appearing as editorial. The latter feature may have been a cheeky attempt to draw readers from the competing Ballymena Guardian which comes out on a Thursday and seems to ‘own’ the classified market. The Guardian, owned by the independent Alpha Newspapers Group, the largest publisher of weekly newspapers in Northern Ireland, no longer has an ABC circulation certificate, although it was selling 13,000-plus as recently as 2008 with what looked like a declining performance. It had two-and-a-half pages of Family Announcements crammed with 160-plus adverts versus just two paid-for notices in the Times, so there’s obviously a newspaper sales and commercial battle taking place there. The Guardian is priced the same for around 25pc more content, but the fact that the Times comes out two days earlier might be giving it an increasing sales edge. I’d be interested to know any more detail from hacks on either paper. Note to Ashley. Sells like hot cakes, looks like s*** . . . . and run by an editor who doesn’t need a content improvement plan ‘cos he/she knows what that particular community wants. Absolutely Cod, a wake-up call to JP that they are charging down a path which will slice chunks of circulation away from the majority of their papers caught up in this re-design process. People would rather have court stories slammed into a page than beautifully designed, centrally generated weather panels and endless reminders about petrol prices and web content. Course there has to be change, but it needs to be more balanced and geared to local markets and carefully thought out. And editors should be at the centre of the process. Halt it now, take stock, and listen to the troops….those that are left. “Sells like hot cakes, looks like s***” As does the Wolverhampton Express and Star. I completely agree with the remarks of the previous speakers. Absolutely agree with all that’s been said here. Please listen Mr Highfield. As Mrs (or was it Mr?) Scroggins’ will tell you, it’s the content that counts most not the look. Design has a place – but story count and facts must always come first. Often subs give bylines because, to use their words, “it helps the layout.” What balderdash. I used to drop a byline box if it meant getting in a couple or three lines or so of fact. There’s always the option…., “writes so and so ” in the intro. And yes people are interested in what goes on at local courts. It is often a barometer of local life and what’s happening in a community. I agree that the Express & Star could probably benefit from tweaking its layout but, as they say, if something is not broken, why mend it?